Magma - Liquid rock produce below Earth's surface. Temperature - if it rises above the melting point of the minerals in the rock. Pressure - if enough is removed, the melting point will drop and the rock will melt. Fluids - the addition of fluids (i.e. - water) can decrease the melting point of some minerals. Volcanism - Any activity that includes the movement of magma toward or onto the Earth's surface. Magma is less dense than the surrounding rock, so it rises. As magma rises, it melts some of the surrounding rock. Magma is forced into cracks in the surrounding rock, causing blocks of rock to break off and melt. Lava - Magma that flows onto Earth's surface. Volcano - A vent or fissure in the Earth's surface through which magma and gases are expelled. Most volcanoes form along convergent and divergent plate boundaries. Pacific Ring of Fire - subduction zones around the edges of the Pacific Plate. As one plate moves under another, water is pulled under and mixes with crust/mantle material. This lowers the melting point and creates magma. Forms a chain of volcanic mountains along the plate edge. Forms a chain of volcanic islands along the plate edge. 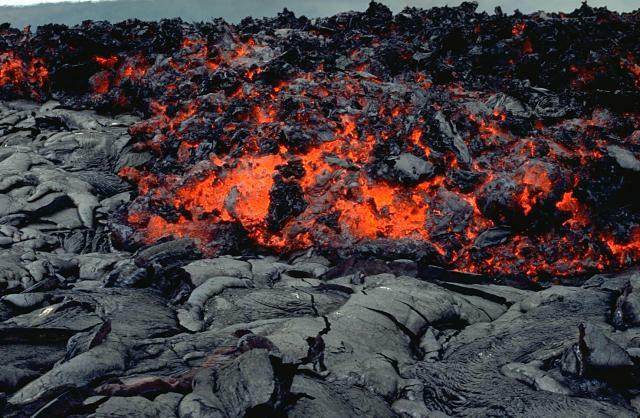 As plates pull apart, lava flows out and creates new lithosphere. Mostly underwater volcanoes - an exception is Iceland. Mantle Plume - A column of hot, solid material from the deep mantle that rises towards the lithosphere. Mantle plumes can generate magma, which can form volcanoes. Mantle plumes remain stationary; the plates above them move. This can generate a chain of hot-spot volcanoes, with the one directly over the hot spot being active. Older ones, which are no longer over the mantle plume, become inactive. Some mantle plumes are long and straight, creating a chain of active volcanoes. These volcanoes do not have specific age-relationships to each other. Change the type of surrounding rock (contact metamorphism). Create fractures/fissures in the rock. Cause pieces of rock to fall into the magma (which are then included in the new igneous rock that forms as magma cools). Pluton - Large formation of igneous rock, formed by intruded magma that has cooled. Dikes - small plutons, only a few cm wide. Mafic - rich in Mg and Fe, dark in color, more common in oceanic crust. Felsic - rich in feldspar and silica, light in color, more common in continental crust. Mafic magma has low viscosity (thin, runny, flows easily) less trapped gas, which leads to quiet eruptions. Felsic magma has high viscosity (thick, sticky) and more trapped gas, which leads to explosive eruptions. Low viscosity allows gases to escape easily. Quickly cooling lava forms a crust, with lava flowing below. Pahoehoe - Lava with a smooth, ropy surface. Crust wrinkles as lava flows beneath. Aa - Lava crust too thick for wrinkles, so it breaks into jagged chunks. Same composition as pahoehoe, different gas content and/or rate/slope of lava flow. Blocky Lava - Higher silica content, so more viscous. Cooled surface lava breaks into large chunks. High viscosity traps gases (H2O, CO2), causing pressure to build up. During an eruption, gas escapes and throws solid/molten particles into the air. Pyroclastic Material - Rock fragments formed during a volcanic eruption. Volcanic Dust - Particles <0.25mm. Can travel around the world. Volcanic Ash - Particles <2mm in diameter. Mostly settles on land around volcano. Lapilli - Particles <64mm in diameter. Usually fall near vent. Volcanic Bombs - Large blocks, thrown out while molten. Spin & cool, develop a round/spindle shape. Volcanic Blocks - Solid rocks blasted from the vent. Can be as large as a small house. Vent - This is the crack in the crust where magma comes up from the mantle. Crater - The funnel-shaped pit, at the top of the vent, where the lava comes out. Formed as material is blown out by explosions. Cone - This is the "mountain" that is built up around the volcano's crater. Broad at base, with gently sloping sides. Mafic lava flows out, hardens, and builds up layers around the vent. Steep slopes, close to 40o. Form from small explosive eruptions. Made up of pyroclastic material. Usually small - a few hundred meters tall. Volcano alternates between quiet and explosive eruptions. Made of alternating layers of lava and pyroclastic material. Often are large volcanic mountains. Caldera - A large, circular depression that forms when the magma chamber below a volcano partially empties and causes the ground above to sink. ex. - Crater Lake, Oregon. Changes in earthquake activity, especially increases in strength and frequency. Changes in the tilt of the volcano's slopes, which may indicate magma moving towards the surface (causing it to bulge). Changes in amount and composition of gases released by the volcano. Why Deadly Volcano in Japan Erupted without Warning - News Article with video clip (1:00).